Is there another living American director with a greater run of movies than Oliver Stone? The dozen films he directed over a span of 13 years, from 1986-1999, form a body of work unparalleled in contemporary cinema. This might sound like Stone, who turns 70 on Thursday, has retired, although of course he hasn’t. His more recent films (“Savages,” “Wall Street 2: Money Never Sleeps,” “W.”) haven’t had the impact his earlier work did, but his artistic fire remains. His new movie “Snowden,” which opens Friday, stars Joseph Gordon-Levitt as Edward Snowden, the National Security Agency whistle-blower who revealed the extent of the invasion of privacy the US government had resorted to post-9/11 to combat homegrown terrorism. “Snowden” is discussed in the last chapter of “The Oliver Stone Experience” Seitz links the film to the theme of “The Beast,” or the military-industrial complex, that recurs throughout Stone’s work. But most of the 480 pages of this massive, six-pound volume, which you don’t so much read as you spend time with, are devoted to Stone’s life and career. The bulk of the book is Q-and-A conversations between Seitz and Stone, drawn from more than 100 hours of interviews conducted from 2011-2015, that cover everything from Stone’s childhood to his tour of duty in Vietnam; his film school education at New York University (Martin Scorsese was one of his professors) to his early work as a screenwriter, including “Scarface,” “Year of the Dragon” and “Midnight Express,” for which he won his first Oscar. His smaller, lesser-known projects, such as his ambitious 10-part documentary “The Untold Story of the United States,” which Stone calls his best work, or his controversial interviews with Fidel Castro; and an endless number of irresistible anecdotes, such as the director’s combative relationship with producer Dino De Laurentiis, his original vision for “Conan the Barbarian” (a 12-film series) and his opinion of Stanley Kubrick’s “Full Metal Jacket” (Stone didn’t like it the first time around but grew to love it). Seitz, who is best known as the TV critic for New York magazine, is also a veteran movie critic who was a 1994 Pulitzer finalist for his reviews for the Dallas Observer, wrote trenchant criticism for the now-defunct New York Press and is the editor-in-chief of RogerEbert.com. He has written two books about the films of Wes Anderson, elegantly illustrated in the style of Anderson’s movies. 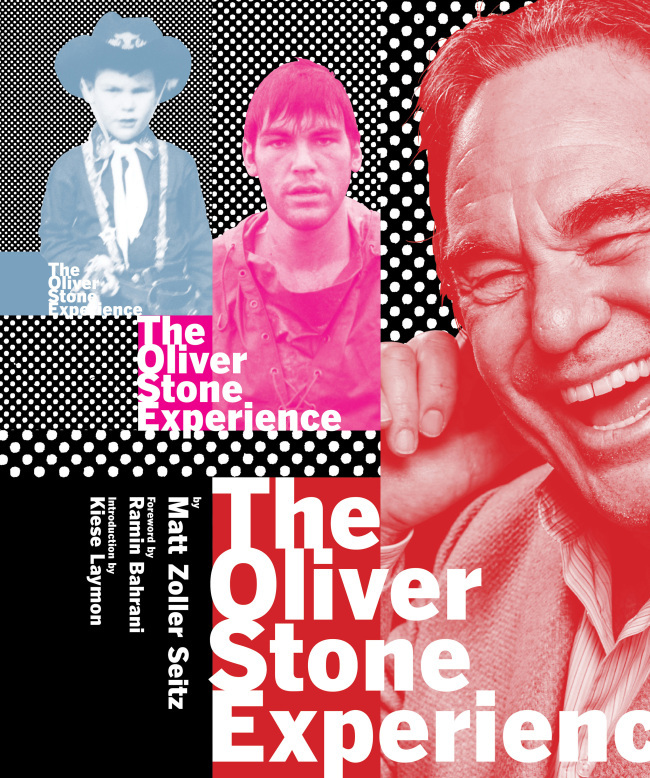 But “The Oliver Stone Experience” is his biggest, most ambitious project to date. The book is a combination of film criticism (“For all its gore and cruelty … (‘U-Turn’) is ultimately a comedy about the universe’s indifference to our wants”), biography (Stone talks frankly about his parents’ divorce and losing his virginity to a prostitute his father hired for him), world history (extensive endnotes, compiled by Seitz and Keith Uhlich, annotate everything from Greek mythology to the Black Panther party) and coffee-table photography (the book is lavishly illustrated with photos, script pages, artwork, film frames and Stone’s personal memorabilia). The attention to detail is scrupulous: Short footnotes throughout double as a concise encyclopedia of popular culture (on Josh Brolin: “Ruggedly handsome leading man who is starting to feel like the next-generation Nick Nolte as he ages”). Stone can be a prickly interview subject, but he’s also an uncommonly eloquent and informed artist who doesn’t back down from his opinions. “The Oliver Stone Experience” wouldn’t have worked if Seitz hadn’t prepared so well for his interviews with Stone, who is prone to running off on tangents. Seitz talks about the split diopter shots in “Talk Radio” as comfortably as he debates the currency of myth and how it relates to “Alexander,” Stone’s costly 2004 epic -- Seitz may be the only film critic on the planet to have seen all four versions of the film, which add up to nearly 13 hours of movie. He spars with Stone about his portrayal of women in his early pictures, dives deep into the director’s editing techniques and use of film grammar and explores the autobiographical strands in his movies. But what shines through brightest in “The Oliver Stone Experience” is Seitz’s profound admiration and respect for Stone’s work and, by extension, the man. The best critics are able to express how a piece of art affects their lives -- they can personalize something by connecting with it on an emotional or intellectual level -- and this lavish, beautiful book is as much a piece of serious criticism as it is an expression of pure movie love.